QUEEN GERTRUDE: More matter, with less art. In what was doubtless an attempt to get a bunch of taciturn teens to learn the pleasure and usefulness of writing in real life, our 8th grade English teacher, Mrs. K, had us all sign up for an international pen-pal exchange. You filled out a form, and could select as many different countries as you wanted pen-pals from; Mrs. K mailed the forms off, and then you’d get the names and addresses of all your new correspondents, and in turn your information would be sent out to people your age who wanted to write to someone living in a small town in western Canada. I wanted to write to everybody, everywhere. I started off with close to a dozen pen-pals around the world—girls whose names I’ve since forgotten, in Athens, Tokyo, Quezon City in the Philippines, small towns in Ireland, France, Denmark, England, Australia. I’d look their towns up in the atlas, all of them seeming impressively abstract, just dots on colored maps representing a world I’d seen very little of. I was in awe of the girls who had managed to learn how to write not just in more than one language, but for the Greek and Japanese girls, in multiple alphabets. I delighted in puzzling through their dictionary and phrase-book vocabulary, their often-confusing transliterations; writing to my French pen pal kept me humble (then as now, my written French has all the eloquence of a well-intentioned but badly-educated 3rd grader). Even the English and Australian girls presented challenges, taking for granted that, in the Commonwealth, we must all call things by the same names; that school, and home, and social lives would be organized the same in every country. French high school was (and still is) completely mysterious to me, and I have only a vague idea of what forms are in the British system; according to the girls in Ireland and Australia, the drinking age was 13, though I was pretty sure their tales of ending up passed out in fields while their mates drove around with some older blokes were, in real life, no more glamourous than the Canadian equivalent; and while most of the girls I was corresponding with lived lives pretty comparable to mine in terms of middle-class comforts, I think I might have suspected that, without MuchMusic AND MTV, they were somehow 3 or 4 decades behind Canadian culture. It took me years before I figured out that, when my English friend J. said her family was living in a caravan while her parents built their house, she was talking about a trailer and was not, in fact, living amongst gypsies. Most of the girls wrote to me on airmail envelopes—each letter was one sheet of thin blue paper with adhesive flaps, that folded into an envelope marked importantly: “AIRMAIL PAR AVION.” You could only write as much as you could fit onto one and two-thirds sides of the paper—many of the girls had tidy, compact hand-writing, the letters shaped differently from the way we’d been taught, the Europeans putting lines through their 7s, the Japanese girl’s careful romaji (roman alphabet) retaining the calligraphic look of kanji. We had airmail envelopes in Canada, but it seems to me that they didn’t save all that much in postage; more importantly, I tried one once and didn’t like the constraints–only one and two-thirds of a page! So I used the stationery sets that used to be supplied by grandmothers to ensure their grandchildren would write to them regularly. Each set included 12 sheets of pastel-coloured paper with patterns, 12 matching plain sheets, and 12 envelopes. I’d always end up running out of paper with half a dozen envelopes to spare—never mind the constraints of the airmail envelope, never mind the limited conversation of teen-age girls, I had a LOT to say, to every single one of those girls, and I yearned for them to say a lot back to me. I’d ask them about school, and music, and their neighborhoods and friends. I’d ask them about the tv or movies they’d seen, or books they’d read. I’d ask about their ambitions for university and careers. I’d ask about French/Japanese/Greek boys (Irish/English/Australian lads). And with only minimal prompting, or none, I’d supply the corresponding information about myself. It was a bit daunting to keep up with so many correspondents, but, not having a terribly full social calendar, I had the time. 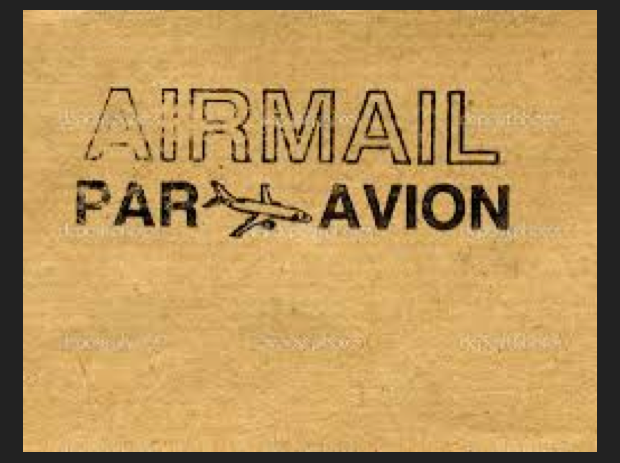 Long before we could have imagined such things as email, of Facebook or Instagram (or whatever the next thing will be), all of those blue AIRMAIL PAR AVION envelopes held out the promise of epistolary friendship, somehow transcending all the pitfalls of more immediate social interactions in the hallways of my school. My pen pals couldn’t know how popular I was or wasn’t; they weren’t there, in the school, absorbing the tacit, unconscious communication about who ranked how in the social hierarchy; they couldn’t know anything about me, other than what I told them (and of course, the fact that I had the time to write pages and pages to them about all kinds of things other than parties and boys probably told many of them all they needed to know about my social status). I think, without meaning too, that I might have overwhelmed some of my pen pals with all my questions, comments on their answers, descriptions of my own situation. And it’s equally possible that most of those girls had the kind of full social calendars I didn’t, and just had better things to do with their time. I have to remind myself that not everyone likes to express herself as much I do. Eventually, by 12th grade, they’d dwindled down to just a couple, the girls in England and Australia (both made it to British Columbia to visit while we were all at “uni,” and while the Australian went her own way soon after, I’ve stayed in touch with J. ever since, and manage to see her every few years when I’m in the UK. J’s kids find her letters quaintly old-fashioned). But it didn’t matter how many pen pals I had—as their numbers fluctuated over the years, I’d fill any surplus time by writing to myself. I’ve got a box somewhere of about 20 journals, most of them covered in chinoiserie brocade bought in Chinatown gift shops in Vancouver, filled with pages and pages of my adolescent confusion and emotional turmoil and social triumphs and defeats (I keep a journal still. Whoever ends up Max Brod to my Kafka—seriously, if someone says “burn my stuff when I’m gone” and it’s their teenage diaries—get out the gasoline and matches*). Plus I had a writing notebook for creative work (mostly embarrassingly-maudlin poetry). And of course there were the essays I wrote for school, reports on Morocco, or Egyptian burial practices, mostly copied, in exhaustively plagiarized detail, from the library encyclopedias; poetry explications; French compositions; science reports on leprosy and the technology of cassette tapes. I had a lot to say, and would—will—say it just about anywhere, in any written medium. Speaking directly to other humans has always been fraught with peril—It has always been so much easier to express myself through writing, rummaging through my vocabulary, my repertoire of expressions and sentence patterns and punctuation marks, arranging and rearranging them like table settings for elaborate dinner parties (ironically, I failed table-setting in Brownies). When I’m writing, I can hear when something is right and accurate, I can feel how the rhythm of a sentence or paragraph has to go in order to be complete—in a way I just can’t do when I’m talking. All I have to do is focus on the letters appearing on the page or the screen, without having to simultaneously, and warily, study the body language and tone of voice of the other person. I still do have a lot to say, all the workings of my creative (good day!) and anxious (trying day!) mind building up (more of those pesky log jams), spilling over in sometimes disciplined, sometimes overwrought prose, in emails, texts, facebook posts, my long-suffering journal, and now—congratulations—here in this blog. So today’s point is this: apparently, blog posts ought to be brief. You don’t want to task readers with too many words, too much detail, too many confessions, and revelations, and views. You don’t want to, but you just can’t help yourself. This is me trying to rein it all in, trying not to overwhelm my gentle readers with too much writing, too much me. And who are we kidding? : I kind of just don’t want to be concise. There’s too much going on, too much thinking and feeling, too much to do–to just boil it, and water it, and break it all down to 160 measly characters. I concede that there are nuances of where and when that I may never really grasp; nevertheless–there are unquestionably things that must be said (aren’t there?) and I just can’t stop myself from saying them. So this is me trying for brevity, and (accidentally on purpose) not quite getting it.